Interested in the Test Design Guidelines & Workshops? This website provides a general overview of The International Civil Aviation English Association (ICAEA), its aims and activities. It is not intended to be a comprehensive or definitive specification. 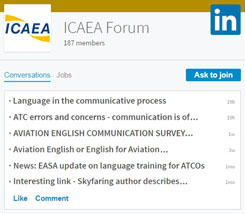 This site is meant to provide information on the Association’s ambitions, its past, present and future events, and, serve as a portal for ICAEA Members and all stakeholders in English language usage by the aviation industry to share news, expertise and experience. Before you register and pay, please make sure you are aware of the visa requirements to enter the country where the event will take place. If your plans change or you are unable to attend this event for any reason, ICAEA will accept a substitute attendee from your organisation at any time at no extra cost. Contact us at events@icaea.aero with the details of the substitute. If you cancel your registration less than 30 days before this event, no refund will be paid. Cancellations made 30 days or more before the event are subject to a 20% administration fee. Refunds can only be made in the currency in which the Registration was paid, ie: EUR. If you register and pay but then “no-show”, no refund will be paid. ICAEA is not responsible for the content or accessibility of any website linking to or from ours. We may not have verified the content of any such website and a link between our and another website does not necessarily imply any endorsement. When you choose to follow a link to another website you do so at your own risk. It is your responsibility to take protective measures to guard against viruses and other destructive elements. Under no circumstances shall ICAEA be liable for any special or consequential damages that results from the use of, or the inability to use, any information or materials on its website. Your use of any information or materials on this website is entirely at your discretion and own risk. It shall be your own responsibility to ensure that any articles, products, services or other information available through our website meet your specific requirements. If you believe that any material on the ICAEA website infringes on a copyright that you own or control, please contact us info@icaea.aero and we will address the matter as soon as possible. Join 700+ registered Members from 80+ countries around the world. If you work in or with the industry, we invite you to join and share your expertise and experience.